Internet Brands October 10, 2018 Comment Now! 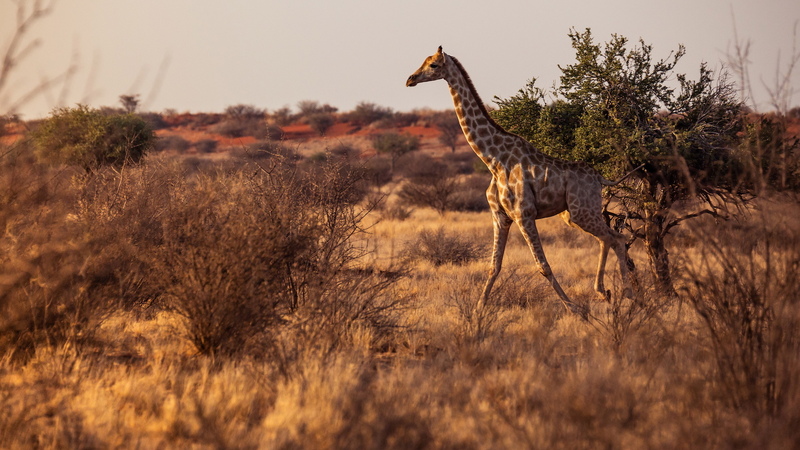 Embedded deep in the Namibian desert, surrounded by orange sand that looks like it was imported from Moab, we discovered one of the unexpected benefits of driving an electric car: Giraffes don’t gallop away as you creep up on them. 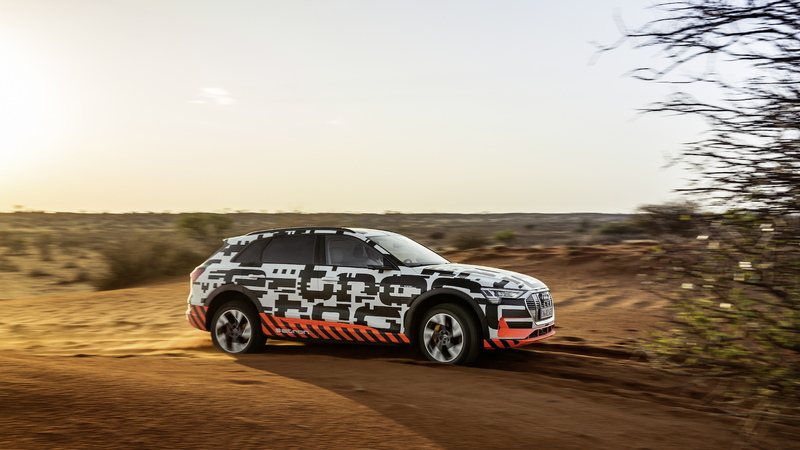 The noise of the tires slowly crushing loose rocks and sand alerts them of our presence but they merely look on curiously, as if baffled by the psychedelic camouflage covering our Audi e-tron prototype’s body. “When we drove here in a Toyota Hilux, the giraffes started running as soon as they heard the engine,” Audi engineer Christian Graf pointed out. Will the multi-million-dollar safari industry surf the electrification wave? It wouldn’t surprise us, though we’d be worried about finding a fast charger out in the bush. Range and charging anxiety are two elements Audi wants to permanently delete from the minds of motorists as it launches its long-promised electric car offensive. The e-tron is the company’s first series-produced battery-powered model. The white, black, and orange wrap on the prototypes we drove can’t hide the fact that it looks like an Audi. Spokesman Benedikt Still explained that was intentional. Stylists wanted to maintain a high degree of familiarity to reassure buyers worried about making the switch from gasoline to electricity. The e-tron is not as bold as the segment-bending Jaguar I-Pace, but it’s more approachable. It adopts key Audi styling cues without completely copying another model. The down-to-earth theme continues inside, where the only sign that a battery pack lurks under the passenger compartment is the charge gauge on the left side of the digital instrument cluster. The user-friendly, dual-screen MMI Touch Response infotainment system comes straight from other Audi models, like the 2019 A8 and 2019 Q8. Though we drove pre-production prototypes, Audi still assured us what you see inside is what you’ll get when e-tron deliveries begin in early 2019. The not-insignificant exception is the camera-based rear-view system. The drag-reducing, range-boosting (slightly) feature will be available in Europe and in other global markets but it falls on the wrong side of regulations in the United States. Our version will consequently get the tried-and-true (but significantly less forward-thinking) door mirrors. Power comes from a 1,543-pound, 95-kilowatt-hour lithium-ion battery pack that feeds a pair of electric motors. The battery is mounted directly under the passenger compartment and it’s about as big as a queen-size mattress. The system’s total output checks in at 400 horsepower and 490 pound-feet of torque, though the drivetrain only delivers the last 20 percent of those figures in 8-second bursts when a temporary overboost function kicks in. Overboost automatically turns on in the S and Offroad driving modes. Alternatively, the driver can manually unlock overboost in any mode using the touchscreen. Mounting a motor over each axle creates a through-the-road all-wheel drive system that Audi bills as the next chapter in the decades-long history of its Quattro system. The drivetrain is rear-biased—for maximum efficiency, not handling prowess—but the drive control unit shifts torque between the front and rear axles in a fraction of a second when needed. We lapped a makeshift track laid out on a dry salt pan and the electronic wizardry did a remarkable job of keeping the front end pointed in the right direction, even when we entered a turn carrying more speed than made the engineer sitting shotgun comfortable. The rear end sometimes indicated it wanted to break loose but the front motor swiftly took over with a confident, “don’t worry; I got this” attitude and steadily pulled the e-tron through the bends. The low center of gravity prevented body roll from reaching the scary end of the dial. The electronics only have a part-time contract with the e-tron, though. As we learned firsthand, it’s possible to turn off the stability control completely and, with a nominal amount of skill, put the SUV sideways on loose terrain to channel the spirit of a Group B-spec Quattro coupe, though inaudibly and without belching a yard of flame from its nonexistent exhaust. Will anyone else actually try that? Probably not, but how many R8 owners actually hit the track? Performance is a key component in the composition of the Quattro character and going electric isn’t an excuse to mute it. The e-tron needs to feel like a real Audi. Michael Wein, the engineer in charge of developing the braking system, told us the project’s North Star was the simple (but not universal) theory that an electric car should be, well, a car that’s electric. It shouldn’t look like a George Harris-era sci-fi prop on wheels and it shouldn’t drive or sound like one, either. 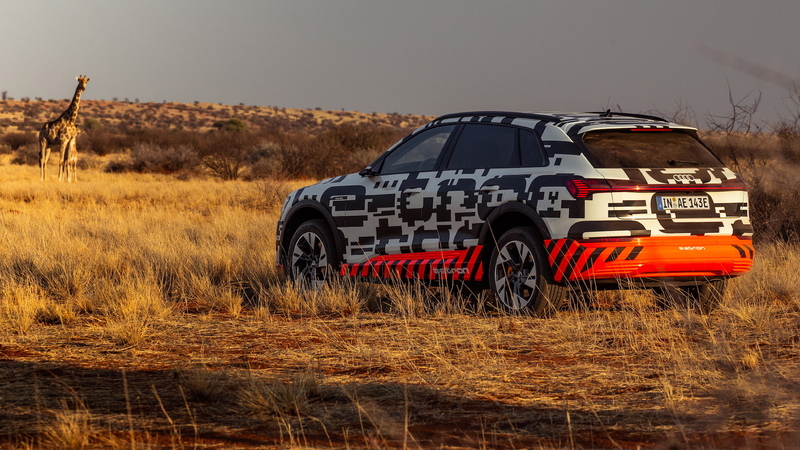 Mission accomplished, though the development team could have easily strayed far from that path and taken the spaceship route because the e-tron packs an amount of computing power that’s unparalleled in the Audi lineup. Even the flagship A8 doesn’t come close. Grok this: Audi and German supplier Continental took the costly and time-consuming route of developing a brake-by-wire system with a firmness simulator that makes the pedal feel like it’s directly connected to a master cylinder regardless of whether the car is slowing down via its hydraulic system, its energy recuperation system, or both. The surprising part is that it actually works well. It feels natural, almost exactly like a conventional braking system. We couldn’t tell whether the e-tron was using its hydraulic system or its recuperation system, or when it changed between the two. The simulator is made to Audi’s specifications but, somewhat unexpectedly, it’s also found in the Alfa Romeo Giulia. Audi occasionally lifts the veil of normalness and takes advantage of electrification to put a different spin on familiar functions. For example, selecting the Offroad mode automatically turns on a hill descent control system set using the pedals, not a stalk. The shift paddles on the steering wheel let the driver dial in the amount of energy the drivetrain recuperates when the car coasts. And, the brake-by-wire system eliminates the ABS pulsations normally felt through the brake pedal when the ABS is at work. Placing the battery pack in the middle of the chassis increases structural rigidity by 45 percent compared to a similarly-sized, gasoline-powered SUV. All four doors open and close even with one of the wheels hovering a foot above the ground. The e-tron isn’t an off-roader, though. Offroad mode adds about two inches of ground clearance under its belly but Graf compared its off-road chops to those of the Q3 or Q5. 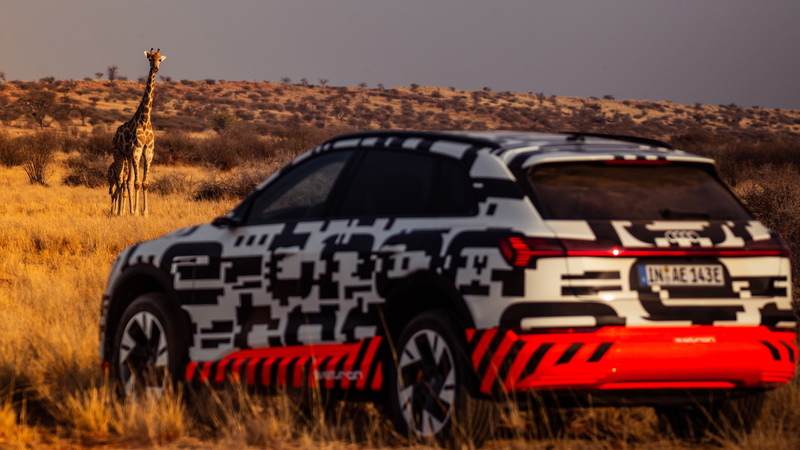 We weren’t able to drive the e-tron on pavement so we can’t give a full verdict on its ride quality, though we noted the air suspension makes driving on a dirt road bearable. Active lane control? Couldn’t test that here; we last saw lane lines when we flew out of Windhoek in a tiny, French-built Cessna. The on-board giraffe detector (a German-speaking park ranger with binoculars and a walkie-talkie) worked well. We didn’t find him on the list of standard features, so you’ll need to source your own. Audi quotes a respectable, 250-mile range when the e-tron goes through the WLTP testing cycle currently plunging the European car market deep into the throes of compliance hell. The EPA hasn’t run the battery pack dry yet but Scott Keogh, president of the company’s American division, said a convoy of e-tron prototypes left San Francisco with a full charge and reached the shore of Lake Tahoe with about 12 miles to spare. That encompassed 200 miles and a 7,000-foot climb in elevation. The elevation drop helped each e-tron complete the return journey with 90 miles left in its battery pack. 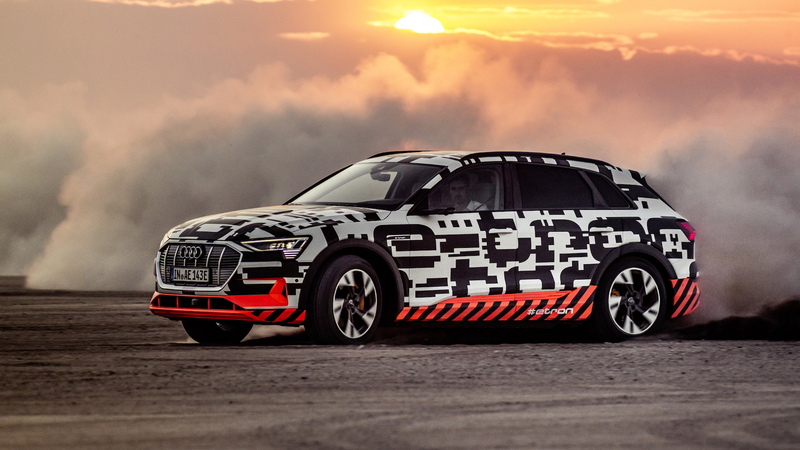 We still have a lot to learn about the 2019 Audi e-tron, but our time behind the wheel of pre-production prototypes showed it’s a promising entrant in the fight for electric car supremacy. Though its inherent normalness won’t turn heads in a parking lot, the e-tron boasts all of the advantages of a zero-emissions drivetrain in a package that’s usable, convenient, and low-key. This could be the electric car for drivers who simply want a car that happens to be electric. Audi provided travel and lodging for this Internet Brands Automotive contributor to bring you this firsthand report.